These are natural questions to ask, and most companies don’t focus on answering them right out of the gate. As your company grows, and your team needs to start making tradeoffs between what features you build and where you spend your acquisition dollars, it’s critical to understand where you’ll be able to generate an outsized impact. Answering these questions is a 4-step process that includes market segmentation, market sizing, competitive analysis and finally, selecting your targets. In this chapter, we’ll take you through why getting this right is so important, and exactly how to do it. Founders build from their personal experience, but the application is likely more broad. Founders are often motivated to solve a problem they’ve experienced first-hand. For my current company, Frame.io, CEO Emery Wells experienced the pain of collaborating on in-progress video edits while running his small post-production studio, Katabatic Digital. 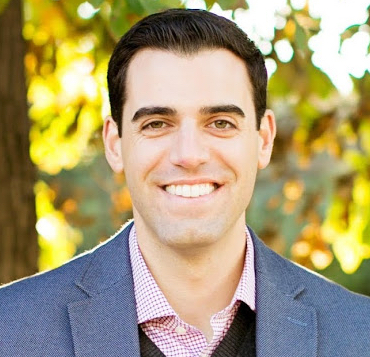 To solve this issue, he and a member of his team, John Traver, set out to build a product that made collaborating on video edits as easy as collaborating on a Google Doc. They built Frame.io by focusing on fulfilling the needs of freelancers and small companies like their own. 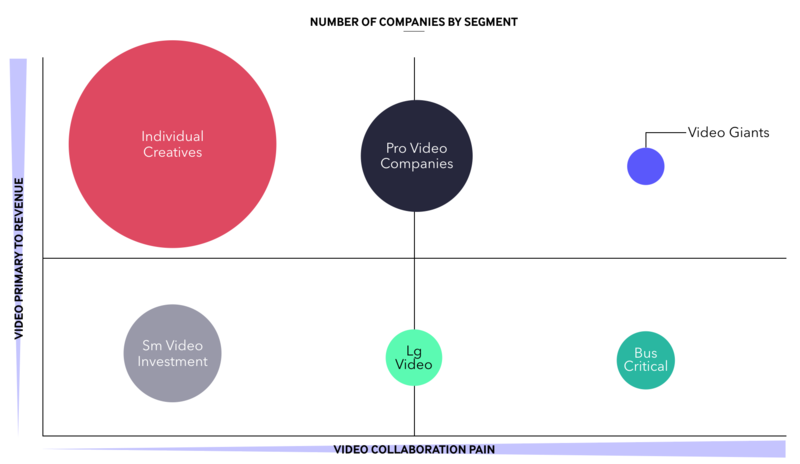 However, over time, enterprise customers like Netflix began knocking on the door, looking for a better way for their thousand-person teams to collaborate on video content. In order to support these enterprise-level customers, Frame.io, as a product and an organization, needed to change fundamentally. Over time, customers will begin to use your product in ways you did not anticipate. In the first version of Frame.io, there was no concept of presenting finished client work. However, in a single weekend, CTO John Traver hacked together a “presentation page” at the request of an early beta user. Fast forward a few years later, and a significant number of advertising and creative agencies use Frame.io solely for displaying their portfolios, reels, and completed client videos. This highlights the fact that your customers will bend your product offering to solve the problems they face, and those problems may be different from the ones you originally intended to solve. Expansion is the key to sustainable growth. Once you’ve built a loyal customer base with the initial version of your product or service, you can generate more value with lower acquisition costs by expanding your offering to that existing audience. Understanding who your most profitable customers are, and how their needs evolve, is critical to driving that expansion. You’re over-indexing time spent on those with low willingness to pay. One of the core audiences Emery and John originally built for, freelancers, often did not have the budget or sufficient work consistency to justify a subscription to Frame.io. While constituents from this audience made up over 80% of total accounts for Frame.io by January 2018, this group contributed less than 25% to overall revenue. In contrast, video teams of 5 or more made up only 20% of users, but drove 75% of the revenue. To scale revenue, it made much more sense for Frame.io to switch their focus to this smaller customer segment. This realization lead to a huge strategic pivot in the company. And with that, let’s get started on the four step process! Generating clear segments is a bit of an art and a science, but at the end of the day, two things must remain true: Your segments should be mutually exclusive and holistically inclusive. Each customer or prospect should fit into at least one segment and none should fit into more than one segment. For simplicity, it’s best to keep total segments to 6 or fewer. 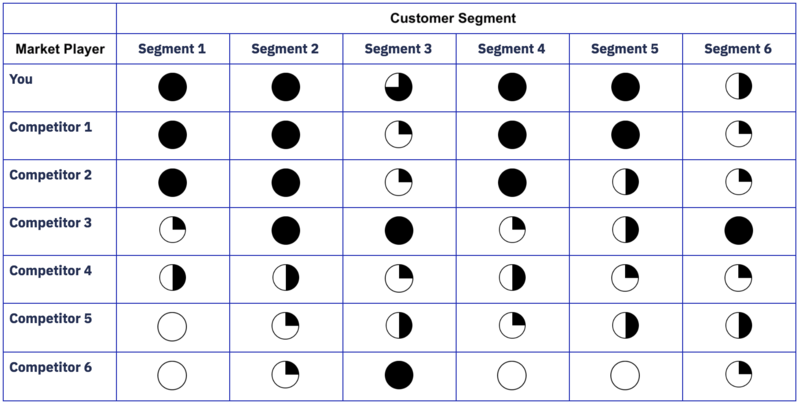 To begin the segmentation process, it’s helpful to think about constructing a matrix. The matrix centers on the two most critical but unique needs, values and attitudes that drive customers when they look for a solution in the market. Settling on the most compelling differences that ensure each customer fits into one segment (and one segment only) takes a lot of trial and error. 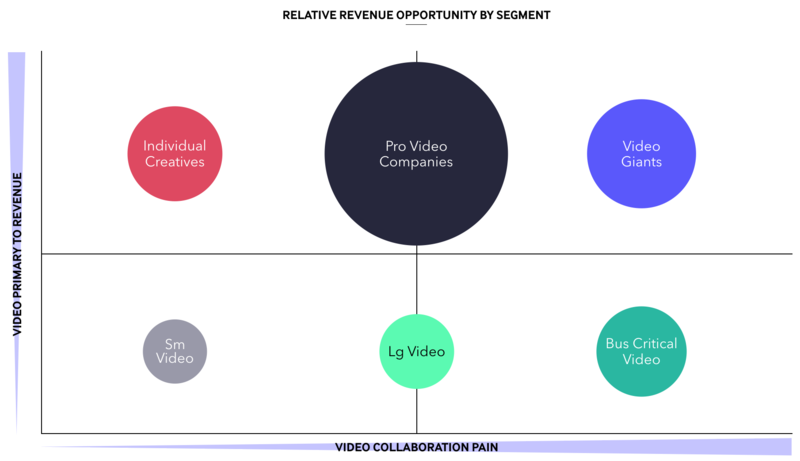 Is video primary to the company’s revenue (yes, no)? 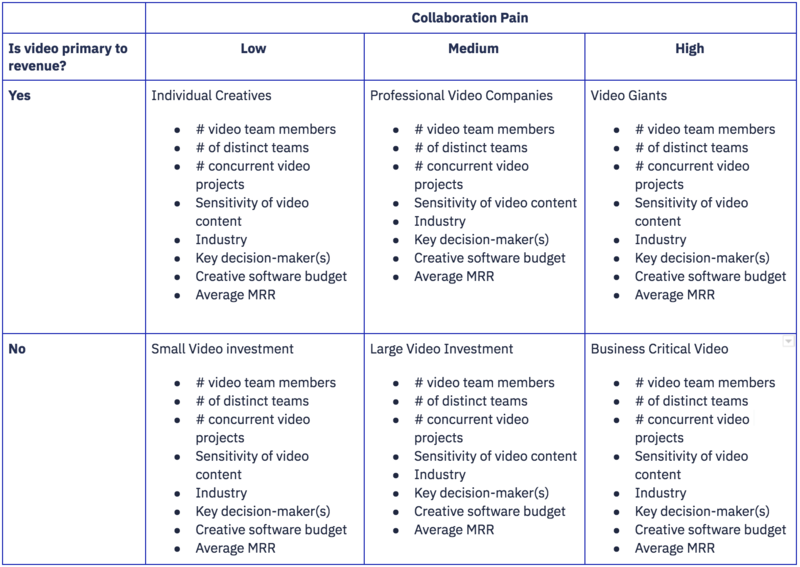 How painful is collaborating today (low, medium, high)? Frame.io's matrix with important segment characteristics. After defining your segments and their characteristics, the next step is segmenting your existing customers – or a least a representative sample. Replace "XYZ" with your current customers. We found very interesting results. 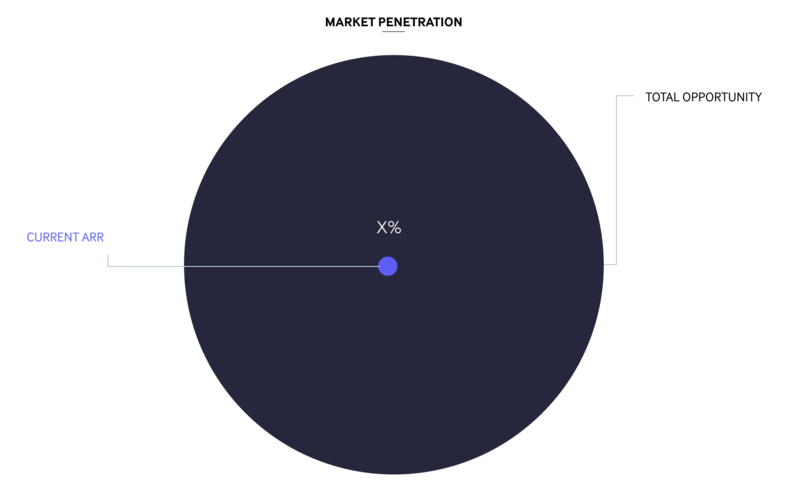 As mentioned before, we determined the segment Individual Creatives comprised 80% of total accounts, but only 25% of revenue and they tended to churn at 4X the rate of other segments. Now that you’ve developed a method to bucket customers and prospects, you can leverage these learnings to identify the full market opportunity. Opportunity can be defined in many ways, but the most common definition among SaaS companies like Frame.io is potential annual recurring revenue. To determine that potential revenue, you’ll need to understand how many entities can utilize your product/service and how much, on average, they would be willing to pay you each year. You can use the characteristics of existing customers to identify new prospects. This process will differ for B2C companies vs. B2B companies. At Frame.io, we leveraged a combination of industry (utilizing NAICS and SIC codes) and employee range to search for the quantity of potential companies that could use Frame.io. There are some great firmographic data resources out there that can help with this. At Frame.io we leveraged ZoomInfo, but Dun & Bradstreet is another excellent option. If you’re a B2C company, more industry and trend research may be required to identify the population with similar demographics and behaviors. Once you’ve determined the volume of potential customers, it’s helpful to lay them out in a chart like the one below for comparison. After determining how many potential customers exist, the next step is to determine how much, on average, each customer can pay you in a given year. You can use existing customer spend as a proxy, but you’ll likely undervalue their spend potential. As a growth stage company, you’re likely to drive more engagement from existing customers and introduce add-ons that can be cross-sold over time, increasing your potential revenue. Calculating the market opportunity is simply the sum of the product of potential entities and their potential value. Once you complete this step, it’s also helpful to layout the relative opportunity by segment in a chart like the one below. What stands out is the fact that the market opportunity by segment is completely different than the volume of entities by segment. To answer that initial question, “how much of the market have we captured already?”, you can simply compare current ARR to the potential ARR. For growth stage companies, it’s often a pleasant surprise to see just how little of a market has already been captured and what remaining opportunity exists. Now that you’ve determined the overall market opportunity and the relative opportunity by segment, you might have the urge to rush into focusing on the largest market segments by opportunity. However, that decision would be shortsighted, without first performing an analysis of the competitive landscape. Some segments of the market may be crowded with competition. Other segments may require significant investment to serve well. To drive an outsized impact with limited resources, you ideally want to focus on the segments with the largest opportunity that you currently serve well and have little competition. How well do you and your competitors currently serve each segment of the market today? To determine a “segment fit” index requires a solid understanding of customers’ needs and your competitors’ offerings. Once you’ve completed that research, you can record segment fit in a table like the one below. Who do you best serve today? Who do you need to serve better? Where do you face the most competition? You’ll naturally start to list the features or offerings you need to bring to market to better serve those underserved segments. The next question is how much investment is required to bring your offering up to par or exceed your competition in a given segment. Now that you’ve got all the building blocks in place, you can make a decision as to where you want to compete, where you want to invest, and how much time and resources you’re willing to invest in each segment. As a growth phase company, the most important action you can take for success is to spend your time and resources on the activities and customers who will drive the most outsized impact for your business. The exercise thus far has provided you with the information you need to determine which 1-2 segments your company should prioritize. This decision can help every team in your organization focus on work that will most dramatically impact your bottom line. Once your organization knows its core segments, your product team knows who they should build for and more importantly, who they shouldn’t build for. Your sales team is better equipped to know which inbound requests they should prioritize, and more importantly, with whom they should be filling their prospect lists. Your marketing team knows which channels and audiences they should target, and the messaging that’s most relevant to your core segments. Who do you best support today? Which underserved segments can you most easily bring up to par? Where will your competition invest? After completing this exercise at Frame.io, we decided to focus on the Professional Video Companies and Video Giants segments. Since that decision, the entire organization has felt a stronger strategic direction, and I hope this advice helps your company do the same.